Shot Glass is a lightweight raid frame, which can be configured to show specific Aura Indicators, in addition to Health, Incoming Healing, Mana, Aggro, Range, and Target. No Libraries are used, and the code is very simple, which makes it a nice learning tool for people who are learning to program their own raid frames. 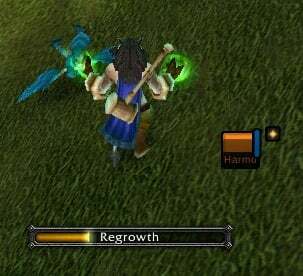 Incoming Heals: You'll see incoming heals as a subtle, semi-transparent bar, indicating the future health of the unit. Aura Indicators: Along the top edge of each unit frame, there are three circular indicators. On the bottom edge, there are three triangular indicators. Stacks are displayed below the indicator. Aggro Indicator: A red border will light up around any unit that acquires aggro. Range: Units out of your range will shrink in size. Mana: Only mana is indicated; Rage, Runic Power, Energy, etc are not shown. I've included two configuration files with the current package. (For Druid and Priest) Feel free to use those files as a template for your own customization. Note: You can find the spell ID# from Wowhead. 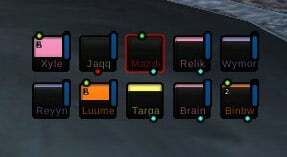 The "Addon" button on your Character Selection Screen will allow you to Enable or Disable the Aura List for each character. - Changed font to Blizzard's Arial Narrow. This will make life easier for international clients, and reduces the whole ZIP package to 15kb. - Trying to fix the overlap bug. I've disabled the option for the frames to grow to the right, until it's fixed. Implemented slash-commands. See readme.txt for a list of commands. Added Vehicle Support, Spell Priority, External Configuration for Auras. Clique Support, Bug fixes, Incoming Heals. Bug Fix: Certain events reset the attributes of the unit frame, breaking the link. This update will restore those links when attributes are changed. Thank you for this! Exactly what I was looking for! I just finished reading your code for this addon and I must say well done sir! Last edited by Munglunch : 01-16-14 at 02:08 PM. Generally more options in the configuration panel. At least those that were configurable with the /shotglass command. We are considering bringing back some of the /shotglass commands. We are considering an option to show not only mana, but also energy (rogues) and focus (hunters). This will enable a tank to better see when to start pulling. Last edited by Pinghansen : 01-15-14 at 07:09 AM. Anyway to resize the unit frames to make it bigger? I've never considered adding profiles, primarily because I'd intended this to be a 'tinkerer's project', encouraging folks to modify it themselves. Any chance on adding the ability to save profiles? This doesn't affect party frames right? Thanks for the report, Mik! Happens to me in LFR while playing with my Priest. Last edited by mikma : 01-27-12 at 06:13 AM. Re: Is this addon still being actively worked on? I second this.. 2-3 indicators on the left side would be nice. This has been on the table for quite a while. Tooltips SHOULD be enabled, but neither Daniel nor I can see why they won't show . If you can come up with a fix, then I'm quite sure that it will be implemented post haste. Last edited by Pinghansen : 01-14-12 at 12:46 PM. Is this addon still being actively worked on? Either way, excellent addon. Thank you for your effort. A) I'll look into the Int buff oddity. B) Side indicators... I tested this, but it looks too cluttered for my taste. C) Groups: Raid members SHOULD end up in the same group. That's how it used to work, anyway. It's been a little while since I've raided, though. I'll look into this, too. Also, I tried to make the following for my mage just to track +int buffs. I get the indicator there when I buff. If i right click the buff off then it goes away only to come right back. Also when in a raid I see the indicator blinking on and off for everyone non-stop. I could also use spell IDs 1459 & 61316 but I went with the text. Not sure if it really matters. Also would it be possible to group people in the same groups as the raid? Last edited by Rezman : 01-12-12 at 08:19 PM.